1. 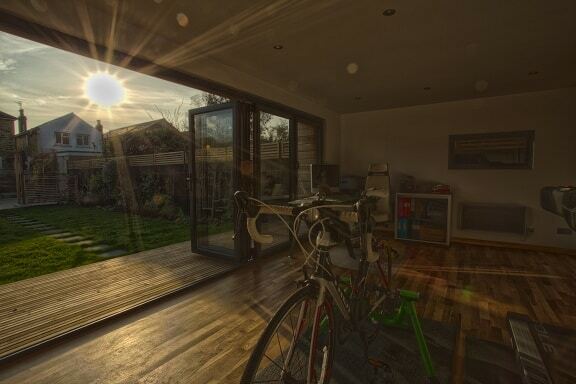 Why did you want to develop a garden room? I love working from home and the extra time it allows me to spend with my family, but was finding it extremely hard to escape the noise and distractions created by two young children! I needed my own office space in which to focus on work: a closed door just wasn’t enough. 2. What made The Garden Escape stand out from the other providers? I found the clean, modern design of The Garden Escape’s buildings extremely appealing. The brilliant natural lighting and extensive views of the garden provide a wonderful, tranquil working space. 3. What are the biggest benefits you’ve noticed, both for you and your family? I can now enjoy starting the day with the family and then take myself out of the house and work in peace and quiet. And the children can make as much noise as they like, without being asked to be quiet because Daddy’s working. 4. How did you find working with The Garden Escape overall? The whole project was managed brilliantly, without any disturbance to the family’s daily routines. My new office was built to my own personal specifications, efficiently and quickly. Overall, an excellent experience.